Elias David Díaz (first name pronounced "ehLEE-iss")...Entered 2017 season ranked by Baseball America as the organization's "Best Defensive Catcher" and 10th-best prospect...Was also rated as the "Best Defensive Catcher" in the Pirates system prior to the 2015 season...Signed by Pirate scouts Rene Gayo and Rodolfo Petit. Spent his first full season in the Major Leagues with the Pirates...Hit .287 (66-for-230) with 12 doubles, 10 home runs and 34 RBI in his 60 starts...Made 70 appearances (59 starts) behind the plate and threw out 11 of the 32 runners attempting to steal against him (34%)... Posted a 4.13 catcher's ERA (549.1ip/252er), had nine errors and picked one runner off base (Addison Russell at third base on 8/19)...Hit .346 (28-for-81) against left-handed pitchers...Hit .403 (27-for-67) with five home runs when leading off an inning...Went 12-for-29 (.414) with three homers in 11 interleague games; homered as the designated hitter on 8/15 at Minnesota...Hit .484 (15-for-31) in April (12 games) and .139 (5-for-36) in May (14 games)...Produced a .287 average (51-for-178) from 6/10 thru the end of the season...Made 14 straight starts while Francisco Cervelli was on the D.L. between 6/22 and 7/7; the longest such streak by a Pittsburgh catcher since Ryan Doumit made 15 in a row in 2009 between 7/10-28. Split season between Triple-A Indianapolis and Pittsburgh...Began season with Indianapolis and hit .305 (18-for-59) with 12 RBI in 15 games during the month of April... Was recalled by Pittsburgh on 5/1 and made first start on 5/2 at Cincinnati; singled off Robert Stephenson for first Major League hit...Was optioned back to Indianapolis on 5/7...Hit his second and final Triple-A home run on 5/29 at Rochester...Was recalled by the Pirates on 5/30 when Chris Stewart went on the disabled list...Connected off New York's Paul Sewald for first Major League home run and had a career-high six RBI on 6/2 at Citi Field; the most RBI by a Pirates rookie since Andrew McCutchen on 8/1/09...Had a career-high three hits on 6/10 vs. Miami...Hit .310 (18-for-58) with 13 RBI in 22 big league games during the month of June...Was optioned back to Indianapolis on 7/7...Was recalled a third time by Pittsburgh on 8/15 and went 4-for-21 in six games before being optioned to Indianapolis on 8/25...Was recalled a final time on 8/26 when Francisco Cervelli went on the D.L... Started 18 of the last 22 games with the Pirates...Went hitless in his last 19 at bats after going 2-for-3 on 9/23 vs. St. Louis...Hit .239 (39-for-163) with 14 doubles, one home run and 19 RBI in his 44 starts...Threw out eight of the 22 runners attempting to steal against him with the Pirates. Began season on Pittsburgh's 15-day disabled list (retroactive to 3/25) with lateral right elbow discomfort...Underwent arthroscopic surgery to remove bone chips from his right elbow on 5/3...Was transferred to the 60-day D.L. on 5/19...Began rehab assignment with Bradenton on 7/4...Went 4-for-5 in his sixth game with the Marauders on 7/13 at Dunedin and went 3-for-4 with a home run and four RBI in seventh and final game with Bradenton on 7/14...Had rehab transferred to Double-A Altoona on 7/16...Played two games with the Curve before having rehab assignment transferred to Triple-A Indianapolis on 7/18...Went hitless in four at bats in lone rehab game with Indy on 7/19...Was reinstated from the 60-day D.L. and optioned to Indianapolis on 7/20...Went 3-for-7 in two games with Indianapolis before being recalled by Pittsburgh on 7/23 when Eric Fryer went on the Paternity List...Made his first Major League start on 7/24 vs. Philadelphia and went 0-for-4 with an RBI; also picked a runner off second base (Carlos Ruiz) in the fourth inning...Was optioned back to Indianapolis on 7/26...Collected a season-high three hits on 8/5 vs. Toledo… Played in his final contest on 9/1 after suffering a left leg infection...Was treated for cellulitis on his left leg in Pittsburgh on 9/5...Was recalled by Pittsburgh and placed on the 60-day disabled list on 9/13; was reinstated on 11/4. Spent full season at the Triple-A level...Was named to the International League mid- and post-season All-Star teams...Also represented the World Team at the All-Star Futures Game in Cincinnati on 7/12...Won Baseball America's "Captain's Catcher" award, given to the best defensive catcher in all of minor league baseball...Made 60 starts behind the plate with Indianapolis and threw out 14 of the 46 runners attempting to steal against him (30%)...Also made 25 appearances as the designated hitter...Hit .325 (27-for-83) and produced 14 RBI in 24 games during the month of May...Swiped lone base on 7/27 at Columbus...Had 18 RBI in 17 games during the month of August...Was recalled by Pittsburgh on 9/1... Made Major League debut as a pinch hitter on 9/12 and flied out to center field...Also struck out as a pinch hitter on 9/30 vs. St. Louis (game two)...Did not appear in a game defensively with the Pirates. Hit .312 (112-for-359) with 21 doubles, six home runs and 54 RBI in a career-high 101 minor league games...Ranked second among Pittsburgh farmhands in batting...Spent majority of season with Double-A Altoona, where he was named "Best Defensive Catcher" by coaches and managers of the Eastern League...Was selected to the Eastern League midand post-season All-Star teams...Was named Curve Team MVP...Made 88 appearances behind the plate while playing with Altoona and threw out 36 of the 110 baserunners attempting to steal against him (33%)...Went 3-for-3 on Opening Day on 4/5 vs. Erie...Was ejected from the game on 4/14 at Harrisburg for arguing whether he was safe or out at home in the ninth inning...Finished April with team-best .357 batting average (20-for-56)...Played first base for the first time since 2009 on 6/18 at New Hampshire after ejections stemming from a bench-clearing incident...Batted .351 (26-for-74) with two homers and 11 RBI in 19 games during the month of June...Went hitless in two at bats during the All-Star Game...Hit safely in a careerhigh 16 straight games from 7/22 to 8/14 and was batting .450 (27-for-60) during the streak before being promoted to Triple-A Indianapolis on 8/15...His .328 average was the third-best in the Eastern League at the time of his promotion (he later fell out of the rankings after not having enough plate appearances to qualify)...Owned the best batting average in all of Double-A, High-A, and even Triple-A among catchers who played in at least 80 games when he was promoted to Indianapolis...Made nine appearances behind the plate with Indy...Participated in the Arizona Fall League, where he hit .260 (13-for-50) in 15 games with Scottsdale...Also appeared in 14 games with Margarita in the Venezuelan Winter League. April 21, 2019 Pittsburgh Pirates activated C Elias Diaz from the 10-day injured list. April 9, 2019 Pittsburgh Pirates sent C Elias Diaz on a rehab assignment to Indianapolis Indians. April 4, 2019 Pittsburgh Pirates sent C Elias Diaz on a rehab assignment to Bradenton Marauders. March 28, 2019 Pittsburgh Pirates placed C Elias Diaz on the 10-day injured list retroactive to March 25, 2019. Virus. August 26, 2017 Pittsburgh Pirates recalled C Elias Diaz from Indianapolis Indians. August 25, 2017 Pittsburgh Pirates optioned C Elias Diaz to Indianapolis Indians. August 15, 2017 Pittsburgh Pirates recalled Elias Diaz from Indianapolis Indians. July 7, 2017 Pittsburgh Pirates optioned C Elias Diaz to Indianapolis Indians. May 30, 2017 Pittsburgh Pirates recalled Elias Diaz from Indianapolis Indians. May 8, 2017 Pittsburgh Pirates optioned C Elias Diaz to Indianapolis Indians. May 1, 2017 Pittsburgh Pirates recalled Elias Diaz from Indianapolis Indians. March 23, 2017 Pittsburgh Pirates optioned C Elias Diaz to Indianapolis Indians. November 4, 2016 Elias Diaz roster status changed by Pittsburgh Pirates. October 5, 2016 C Elias Diaz assigned to Bravos de Margarita. September 13, 2016 Pittsburgh Pirates recalled C Elias Diaz from Indianapolis Indians. September 13, 2016 Pittsburgh Pirates placed C Elias Diaz on the 60-day disabled list. Cellulitis of his left knee. 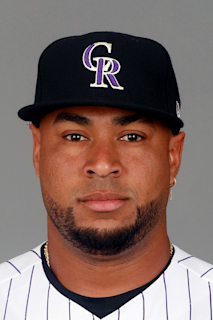 August 19, 2016 C Elias Diaz assigned to Indianapolis Indians from Bristol Pirates. August 18, 2016 RHP Elias Diaz assigned to Bristol Pirates from Indianapolis Indians. August 11, 2016 Indianapolis Indians activated C Elias Diaz. August 5, 2016 Indianapolis Indians activated C Elias Diaz. August 3, 2016 Indianapolis Indians placed C Elias Diaz on the reserve list. July 26, 2016 Pittsburgh Pirates optioned C Elias Diaz to Indianapolis Indians. July 23, 2016 Pittsburgh Pirates recalled Elias Diaz from Indianapolis Indians. July 20, 2016 Pittsburgh Pirates optioned C Elias Diaz to Indianapolis Indians. July 19, 2016 Pittsburgh Pirates sent C Elias Diaz on a rehab assignment to Indianapolis Indians. July 16, 2016 Pittsburgh Pirates sent C Elias Diaz on a rehab assignment to Altoona Curve. July 4, 2016 Pittsburgh Pirates sent C Elias Diaz on a rehab assignment to Bradenton Marauders. November 10, 2015 C Elias Diaz assigned to Bravos de Margarita. September 1, 2015 Pittsburgh Pirates recalled C Elias Diaz from Indianapolis Indians. July 16, 2015 Indianapolis Indians activated C Elias Diaz from the temporarily inactive list. July 12, 2015 Indianapolis Indians placed C Elias Diaz on the temporarily inactive list. March 20, 2015 Pittsburgh Pirates optioned C Elias Diaz to Indianapolis Indians. November 21, 2014 C Elias Diaz assigned to Bravos de Margarita. November 20, 2014 Pittsburgh Pirates selected the contract of Elias Diaz from Indianapolis Indians. August 15, 2014 C Elias Diaz assigned to Indianapolis Indians from Altoona Curve. March 29, 2014 C Elias Diaz assigned to Altoona Curve from Bradenton Marauders. March 4, 2014 C Elias Diaz assigned to Pittsburgh Pirates. October 10, 2013 C Elias Diaz assigned to Bravos de Margarita. April 2, 2013 C Elias Diaz assigned to Bradenton Marauders from West Virginia Power. March 8, 2013 C Elias Diaz assigned to Pittsburgh Pirates. April 4, 2011 Elias Diaz assigned to West Virginia Power from GCL Pirates. June 21, 2010 Elias Diaz assigned to GCL Pirates from VSL Pirates. May 14, 2009 VSL Pirates signed free agent C Elias Diaz.